I am a fish lover. I grew up with them and adore them. However, I married to a guy who grew up in the valley of Rocky mountain, and whose memory of good seafood as child was one of those frozen fish sticks which he seldom got. I think he freaked out when he saw me eating the tiny whole anchovies (including head and tail) when we were dating. No wonder he hesitated kissing me at the beginning of our relationship…, LOL!!! Well, seafood is not his thing. Therefore I don’t get to cook that often, especially the whole fish. 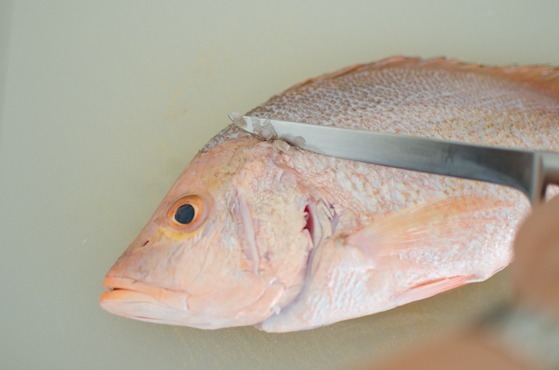 But I saw some fresh red snappers at the store and I knew I had to make something with it. 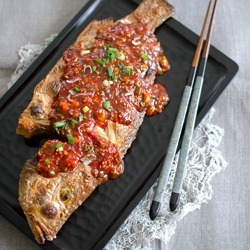 I am making Broiled Red Snapper with Korean Chili Sauce (Domi Goowi, 양념 도미구이). 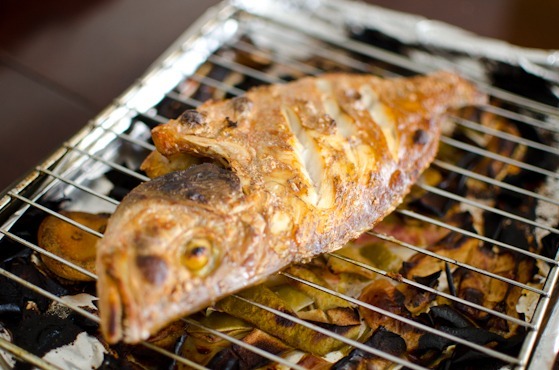 It doesn’t visually bother me to see the whole grilled fish but I believe it does to some. You can ask your fish man to chop off the head for you but I’ll tell you this. There are lots of flesh around the head and you will loose some if you chop it off. And the taste of the part is excellent. No wonder why a few SE Asian cuisines have a dish called fish head curry. 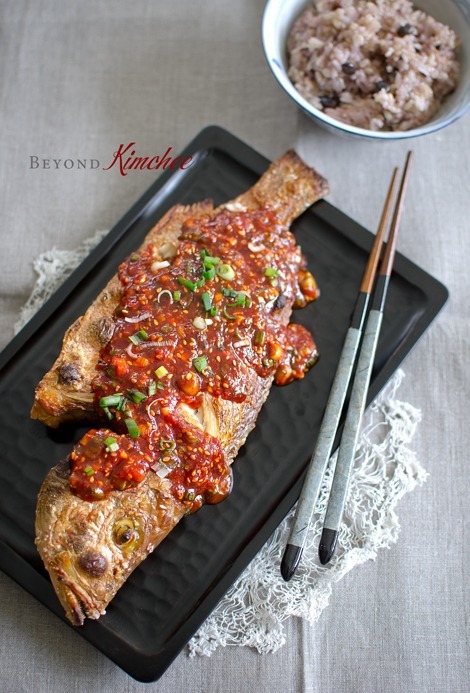 Grilling is the best method to bring the full flavor of this firm white meat fish but broiling does a nice job as well. 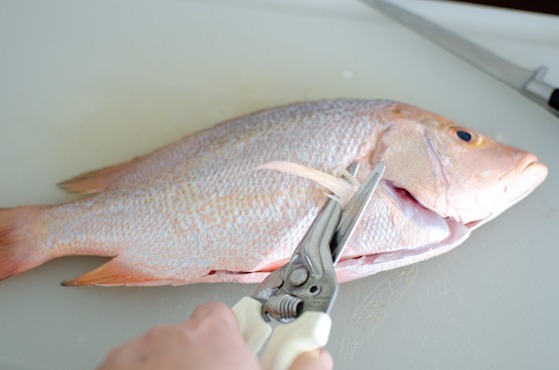 If the red snapper is not available, you can use yellow snapper, flounder, grouper, or any white flaky meat fish. 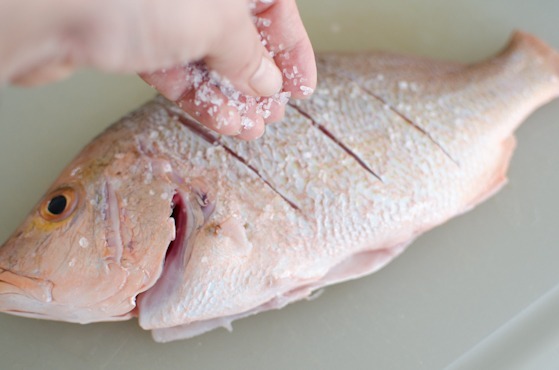 And if the whole fish is not there for you, use fillet with skin attached. Fishes are such a great source of lean protein with low calories and omega-3 fatty acids. 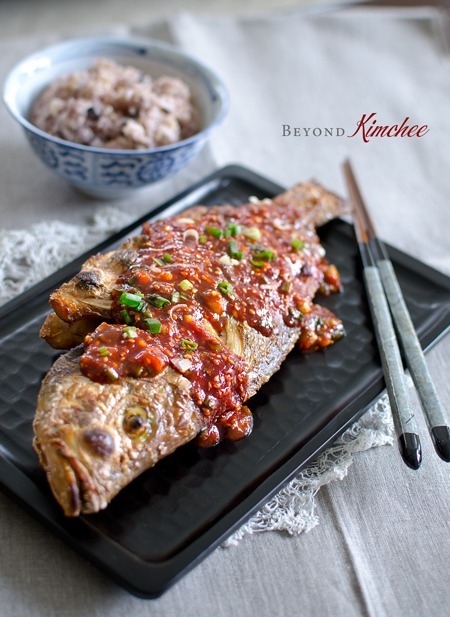 I hope you can give this Korean style broiled red snapper a shot at home. 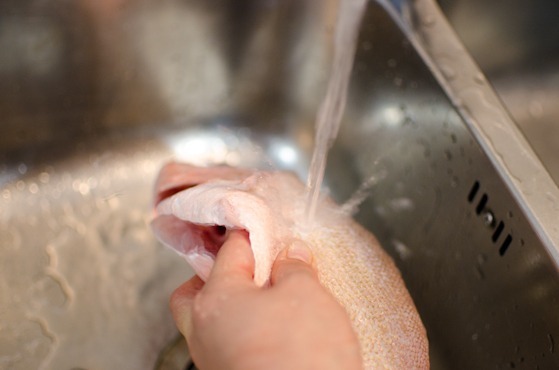 It is easy and quick to fix once your fish is thoroughly cleaned. And very delicious to the taste with a bowl of rice. Here is a very fresh red snapper. One way to check if your fish is fresh is by checking at his eyes. If they are translucent and clear, that a good sign. Dull eyed fish? Pass on. Dull eyed man? Think twice. Second to check is its gill behind the flap of its head. It should be rich in red. Third, smell it. 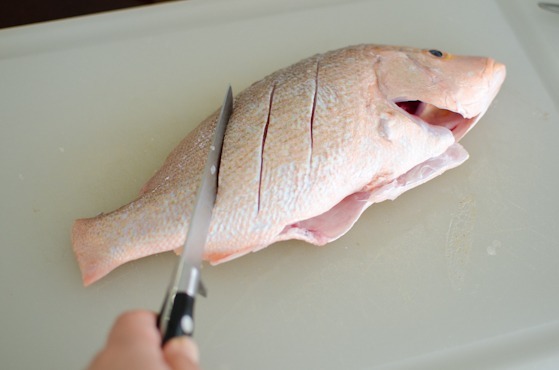 Fresh fish shouldn’t smell stinky. My fish guy at the market was always kind to me. 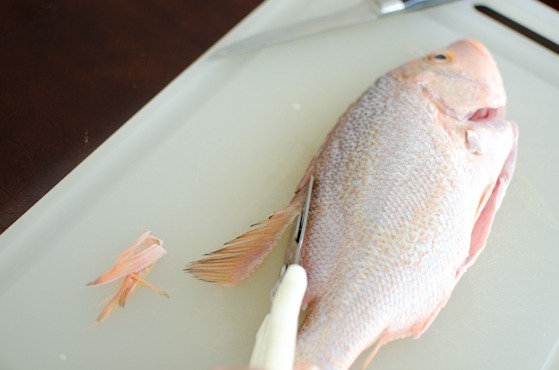 He did an excellent job removing scales from my snapper but I still find a few places that he missed. Chances are you might have to scrape off some scales with your hands as well. It is fun, though. I like to cut off fins. Why? Because they will burn and turn into ash. Cut off all the fins here, there, and everywhere. Give it a good rinse inside out. Give about 2-3 deep slits on each side. 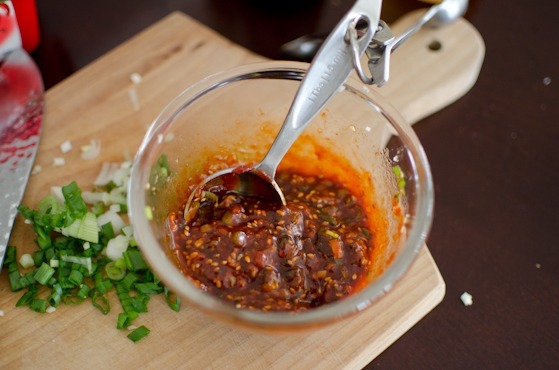 For the sauce, you will need: Korean chili paste, sugar, soy sauce, sesame oil, sesame seeds, green onion, garlic, and Korean plum extract which is an optional. If you don’t have it, add 1 teaspoon of lemon juice instead. Put everything in a small mixing bowl…, then as always, I remembered that I left out someone very important. Miss ginger! You will need her in the sauce. 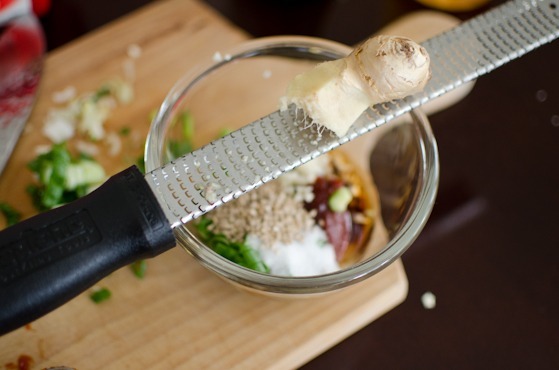 Add in the grated ginger to the bowl and mix everything together. Here is the yummy-yummy sauce. 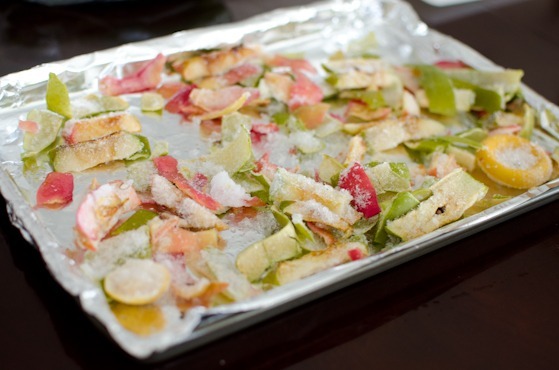 I often keep my fruit rinds(apple, lemon, lime, orange, etc) in the freezer for this purpose. They can cut the fish odor while it is baking in the oven. They also help the fish meat to stay moist. Anyway, line your pan with foil for easy clean up and place rack over it. You will need to spray the rack with oil so that your fish won’t stick. Pour about 1/4 cup of water to the pan as well. Put this guy in the broiler about 4 inch below the heat source, and cook about 8 minutes on each side, or until you see it turning brown. My perfectly broiled red snapper is ready to take the sauce. Drizzle the gorgeous sauce and your are ready to dine. This was my lunch. And I did enjoy it. 1000 times better than frozen fish sticks. Although I do sometimes crave those. Preheat the oven to broiler setting. Line a broiler-safe pan with foil and place a rack on top. Spray the rack with oil. 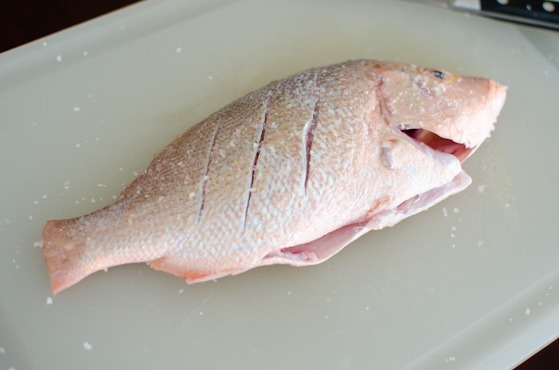 Place the red snapper on top and pour 1/4-1/2 cup of water in the pan. 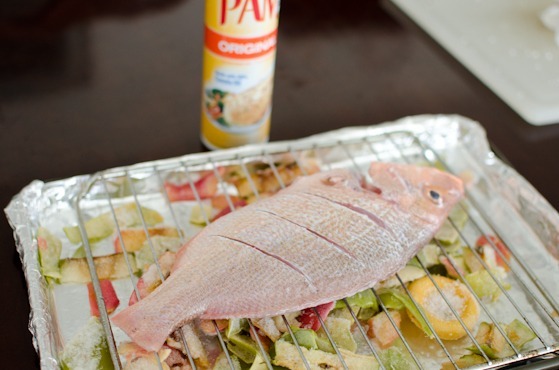 Place the pan in the oven so that the fish will sit about 4" below the heat source. Broil 8-10 minutes on one side. Flip the fish to the other side and continue to broil until it gets deep brown and the meat looks flaky, about 7-8 more minutes. 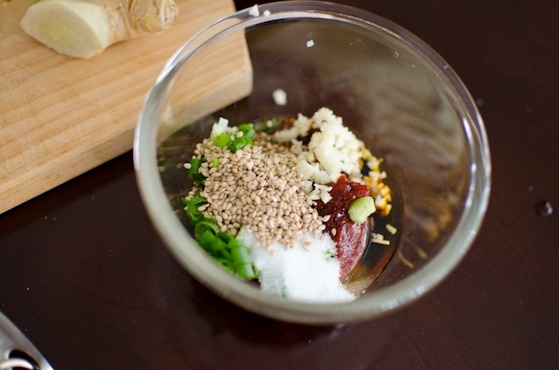 Meanwhile, in a small mixing bowl combine chili paste, soy sauce, sugar, garlic, ginger, plum extract (or lemon juice), sesame oil, sesame seeds, and green onion. Mix well. 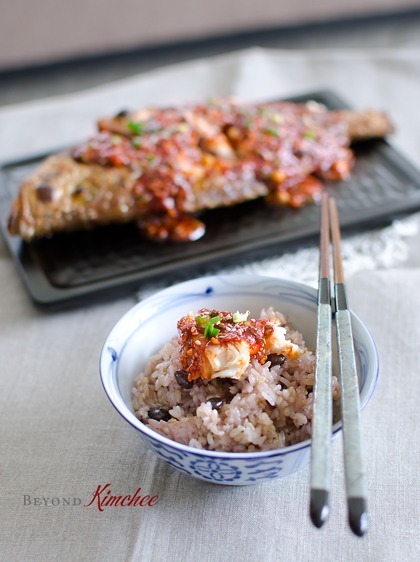 When fish is done, spread the chili mixture sauce over the fish and serve warm with rice. Whole fish do freak out a lot of people in the US! But both meat and fish taste so much better if cooked next to the bone! So I'm all for using the whole deal. Really nice recipe - sounds quite zingy with the chili sauce! I'd love this, I know. Thanks. I know. It takes some experience to get used to. You are right! the meat next to the bone always tastes better. Oh Holly! This is a great post. My mum used to make this for us often as I was growing up and I certainly haven't had it for years! Though I have to admit that yes, the fish does look a bit intimidating. :) I had snapper fish & chip a couple of times, but didn't know what the whole fish looked like. lol Thanks for the oven baking tips too. You're very resourceful! Thanks Sue. 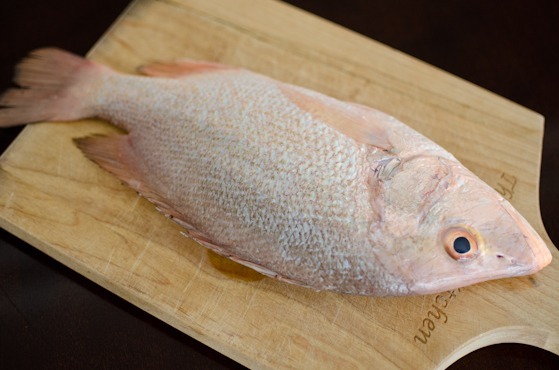 The whole red snapper is hard to find outside Asia. I am glad that I have a great access to abundant seafood here. The beginning story of you and your husband make me LOL so hard :D. Lucky for me that my hubby and I are both fish lovers. I must say it does bother me to see the whole fish...for me, it is no different than seeing a chicken with the head still attached or seeing the heads of sheep or other animals on market stalls..it does take my appetite away! But this recipe looks absolutely delicious so I will definitely give it a try one of these days (minus the head of course :) ). Thanks for posting it! My husband has a friend who is a fisherman and sometimes sends him home with a lovely amount of fresh caught salmon. Since I have a lemon tree, I used to mix garlic and lemon juice and marinate the salmon in the mix and then poach it in that mix with water added. Or, sometimes I would buy fish and dip it in various batters and fry or bake it. BUT - since I read and tried your recipe for slow cooked salmon I have never cooked it any other way since then - it is the best and tastiest way to cook that great fish...thanks for your blog! 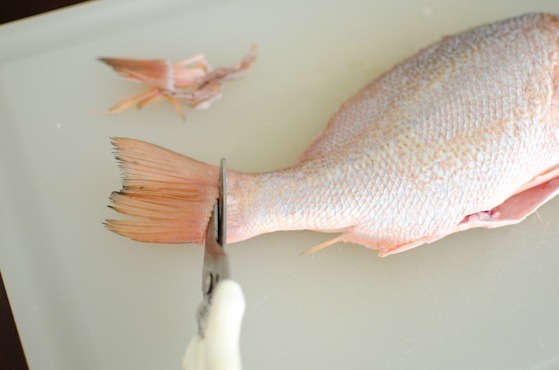 This looks like the best preparation of snapper I have ever seen. I love spicy. I love Korean. I will have to try this over the weekend. 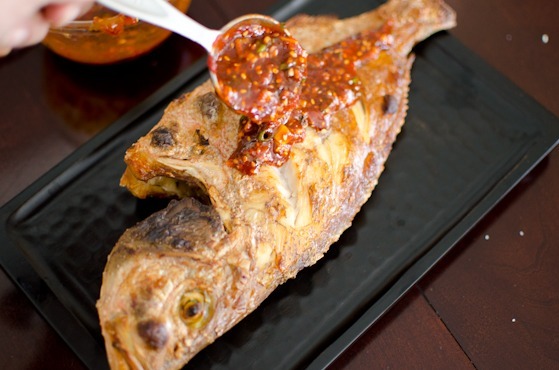 I love broiled fish (if it's VERY fresh) and yours looks delicious with this spicy savory sauce. Thanks for the fruit rind tip -- genius! 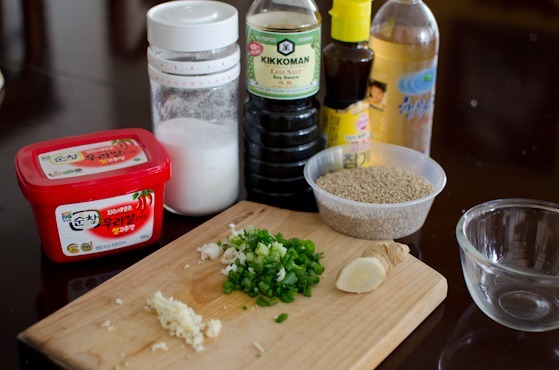 Holly, can you let me know how you cook the rice featured in the picture? Thanks. I used 40% white rice + 40% brown rice mixed in with other grain + 10% black rice + some black beans and cooked in pressure cooker. If you don't have a pressure cooker, you will need to soak the brown rice and black bean separately for at least 1 hour. Rinse out the soaking water from the black bean, though. Delicious! Great recipe Holly, and the no kissing part made me LOL! I normally cook whole fish chinese style - so i steam it. Sometimes i fry blackbean with garlic in oil and pour over the fish with some soya sauce and a bit of sugar and steam, or other times, i will fry spring onion & ginger in oil and pour over the fish along with chinese preserved veg and soya sauce and steam. And the chinese doenjang mixed with a bit of sugar & oil marinaded with salmon and steamed is great too! We cooked trout today following this recipe and it was just perfect. Thank you again. I have yet to find one recipe on this blog I don't like. Glad to hear that it turned out perfect. I am so happy to hear that you liked my recipes. Thank you for your comment. It is on high. YOu will need to watch carefully. Tails or fins can get burn easily and creates smoke. Sorry for the late reply. You can use fish fillet. Reduce the broiling time, though. This looks absolutely delicious. Being Indian, and from the coastal regions, fish has always been a big part of our diet, and I Love it. Currently living in Dubai, we get loads of different types of fish and Red snapper is something we get in plenty here. AANNDD... I LOVE Korean food. So this recipe is definitely going in my list!